Sherko Haji-Rasouli (born September 1, 1980 in Shiraz, Iran) is a professional Canadian football player who is currently a free agent. He most recently played for six seasons with the BC Lions of the Canadian Football League. Haji-Rasouli was drafted by the Montreal Alouettes in the 2002 CFL Draft (2nd round, 12th overall). 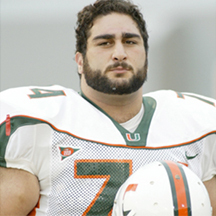 In 2003, Haji-Rasouli suffered a season-ending injury, limiting him to just one game. In 2004, Haji-Rasouli played all 18 games in his final season in Montreal. Haji-Rasouli was signed by the Lions as a free agent prior to the 2005 season. In 2005, Haji-Rasouli played 16 games primarily as the Lions’ first backup offensive lineman though he later moved into the starting lineup (starting 5 games) after an injury to Jamal Powell. Haji-Rasouli caught 1 pass for 3 yards in an August 19, 2005 game against the Hamilton Tiger-Cats. In 2006, Haji-Rasouli played most of the season as a backup but received some starts when Kelly Bates was injured. On January 31, 2011, Haji-Rasouli was released by the Lions.